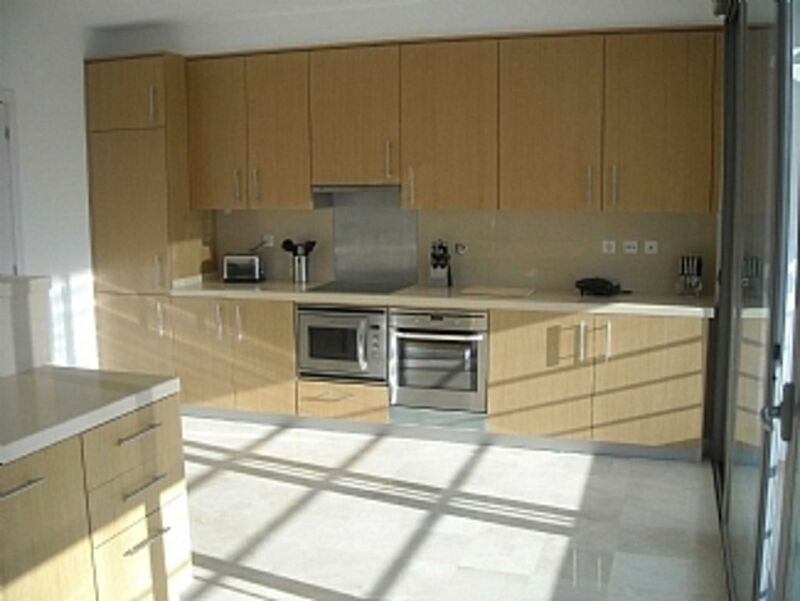 Modern 3 bedroom, 2 bathroom luxury townhouse located within 5-10 minute walking distance of the centre of Tavira. The small gated community provides a safe environment with secure gardens and children's play area in a quiet residential location. The property is within easy access to the N125 and less than 5 minutes to the nearest golf course. The property consists of two private roof terraces equipped with full patio set, sun loungers, BBQ and full width wind sensing awning (totalling approx 73 sqm). Tavira is 40 mins from Faro Airport and has low cost flights from UK airports. The climate is mild and boasts approx 300 days of sunshine. It is only 30 mins from the Spanish border. The beaches are superb and there are 5 blue flag beaches. The Ria Formosa is a nature lovers paradise and there are cycle trails and mountain walks. Tavira island offers excellent fish restaurants in a peaceful tranquil setting, and can be reached by a 5 mins ferry boat. The roman bridge in the town spans the river and there are many varied al fresco restaurants to suite all tastes and budgets. We love the convenience of being able to walk into town for bread, daily paper or a morning coffee and explore the town on foot. There is a daily food market and several large supermarkets nearby. The roof terrace has sunny and shaded areas with sun loungers and parasol to Mountain View/sea view side and a dining table/recliner chairs and barbecue on the inner terrace for long summer nights dining with friends and family. The property has heating and air con in all the bedrooms and living area where you can enjoy Sky TV and DVD, as well as games. There is a very large kitchen that leads to a separate utility room with washer/dryer and internal patio area with table and chairs and clothes dryer if required (stored in utility room). En-suite bathroom (fully tiled wet room) to bedroom 1 with walk in shower, wc, bidet and wash basin with storage Main Bathroom with jacuzzi bath, wc and washbasin with storage. Separate cloakroom with wc and washbasin. 2 leather 3 seater sofas with two coffee tables, Dining room table and chairs, 40" flat screen TV, DVD player, CD/Radio, books, CDs, DVDs and games with access to garden, pools etc. Oven with ceramic electric hob, extractor fan, dishwasher, microwave, refrigerator/freezer, toaster, sandwich maker, coffee maker. Within 10 minutes drive of the property there are 4 golf courses. Benamor 18 hole par 71, Quinta da Ria 18 hole par 72, Quinta da Cima 18 hole par 72 and Colina Verde 9 hole par 28. There are 2 further golf courses within 20 minutes drive from the property. Castro Marim 18 hole par 71 and the 18 hole course Ayamonte. Notes on accommodation: High chair and cot can be supplied with advanced notice at a small additional charge. The property has air conditioning and warm air heating. Outside: Property has twin private roof terraces with large table and chairs, sun loungers, artificial grass, plants and hedges, barbeque and wind sensing awning. The living room has large sliding patio doors with access to central area consisting of large pool and smaller childrens pool, changing rooms, decking and gardens including small childrens play area. There is seating area in various parts of the gardens. Utility Room: Washing machine/tumble dryer, clothes airer, ironing board and iron with separate enclosed outside drying area (using internal patio area). Cleaning / Towels / Linen / Maid service: Cleaned after each visit regardless of duration. Additional cleaning and linen changes available on request at an additional cost. Please let us know if you require this during your stay. Other: Integral garage leading to entrance hall with video entry system to front door, stairs leading to living area and internal patio and then stairs leading to sleeping area with 2nd internal patio and stairs leading to twin roof terraces. this is a really lovely house to stay in. i have never been to anywhere so well equipped, we wanted for nothing. the beds are comfortable, plenty of nice qood quality towels and linen. lots of sitting out areas in sun or shade and the pool area is very nice too. there is an excellent Webber Bbq on the roof terrace with plenty of chairs- and the view is amazing- bring your binoculars. its an easy walk to town- downhill and on the flat and a taxi is very cheap for the return trip. the owners provide beach towels for hire, this is a really good idea, you dont need to fill your case with towels, or books for that matter as there is a good selection of English books. the complex is very peaceful at night and the stars were amaxing. i have no hessitation in recommending Bridgets house. Clean , bright , modern in a location only ten miniute walk to town . First class house ; couldn't fault it . Thank you for your review. Really pleased with your review. Absolute FIRST CLASS property. I can honestly say that during our stay we couldn't have wanted or asked for more. Spacious, superbly equipped, and EVERY little detail to make a holiday enjoyable has been thought of by the more than helpful owners. I don't think I can add to these words, to list everything good about it would take much time and a lot of space! This was our first time in Tavira and we found it to be truly wonderful. the quietness and unspoilt traditional Potuguese nature really appealed to us. If you like laid back, quiet, please yourself holidays then this is for you, if you expect loud bars and clubs it probably isn't. The walk into/back from town was always pleasant, it never felt too long (even when walking back from the supermarket with shopping!). We intend to return, hopefully many times! A Great Holiday in a Fantastic Villa! This property was fantastic! It was like staying in a five star hotel! Clean, well equipped, fabulous kitchen, welcome pack, meet and greet - which gave us information about the villa and area, comfortable beds, - nothing was else was needed. Plenty of sunbeds for all four of us to relax on the roof terrace. The whole complex was beautifully maintained, great pool and sun loungers. Very safe area, felt very relaxed. This was our first visit to Portugal and we were delighted with the town of Tavira. If you want to experience a real Portuguese town that has not been taken over by tourism - then Tavira is the place! Ilha de Tavira is approx 10 minutes drive from the property, to get to the island you need to take an aqua taxi or ferry, pricing in April 2008 for the ferry was €1.30 per person return, the island is roughly 4 km long and has bars and restaurants with volleyball and football on the sandy beach. The beach is never crowded even in peak season due to its peak size. Tavira is situated about 35km east of Faro. There are various ways of travelling from the airport such as taxi, train and bus. Alternatively there are several car rental companies at the airport with very competitive rates especially if you book in advance. The Historic town of Tavira is a 5-10 minute walk from the property with a range of bars and restaurants as well as lots of interesting places to visit. The Spanish border is only 20-25 minutes drive to the East from the property with Faro, Albufeira and Vilamoura less than 30 minutes drive to the West. There are several unspoilt villages within 10 minutes drive. Tavira has an excellent array of shops, bars and restaurants, and a fresh daily market for vegetables fruit and fish. Tavira can be explored by a miniature train or by horse and carriage. There are also many mini supermarkets to get usual supplies. Booking Notes: A non refundable 25% deposit is payable at the time of booking and the balance is required 8 weeks prior to arrival. A refundable security deposit of £200 to be paid 8 weeks before arrival and refunded upon receipt of the return of the keys. A welcome pack is included in the price. Additional items such as high chair and cot etc must be ordered at time of booking to guarantee availability. We have a local contact on hand to deal with any issues that may arise during your stay. Changeover Day: With respect to changeover days we are flexible and will try to meet your needs wherever possible. Notes on prices: Prices are for the property per week in UK pounds.